Samantha Vinokor-Meinrath is the Senior Program Officer of Jewish Life and Learning at The Jewish Federation of Greater Washington. For more information on the Margo & Yoram Cohen Family Israel Engagement Fellowship, a project of the Jewish Federation and JCRC of Greater Washington, visit www.shalomdc.org/teenfellowship. It’s trite at this point to observe that Jews today do not connect to Israel the way we used to. In the context of younger Jews’ Israel disengagement in favor of more universal topics and causes, presenting Israel as meaningful and compelling is a challenge. For Jewish high school students, Israel is abstract and amorphous. It’s a place that they know they’re supposed to feel connected to but that doesn’t necessarily resonate with them on a personal level. We do our teenagers a massive disservice if we underestimate their discerning minds, creative thinking, and passionate opinions. They are not satisfied with platitudes about Israel; they are looking for answers that delve beneath camels and cherry tomatoes. They are eager to engage with complexity and are developmentally ready to wrestle with issues that feel relevant and compelling. Connecting teens with Israel requires providing them with a baseline of knowledge, a safe space in which to engage with content, and openness to multiple truths and outcomes. For teens in greater Washington DC, the Margo & Yoram Cohen Family Israel Engagement Fellowship [IEF] provides that safe space. 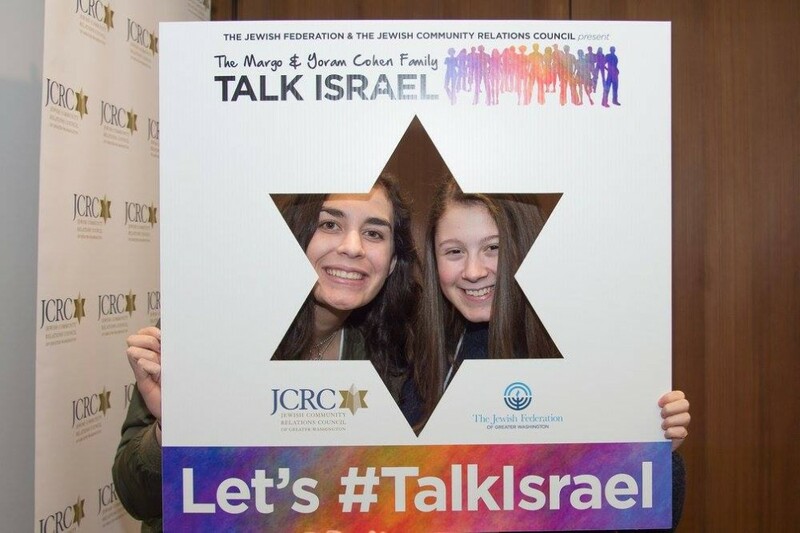 A project of the Jewish Federation and JCRC of Greater Washington, the Fellowship has provided hundreds of high school students with the opportunity to explore and enhance their own relationships with Israel in an open, nuanced way. The Fellowship, which runs for eight sessions, is based on an experiential leadership curriculum, and covers topics including Zionism and Jewish history, Israeli government and culture, the multiple narratives of the Israeli-Arab conflict, and Israel on campus. After ten cohorts of the Fellowship, our staff, in addition to being continually impressed with the maturity and insights of our teen Fellows, has identified a number of best practices when it comes to engaging high school students with Israel. Embrace the legitimacy of multiple outcomes. On the first day of each Fellowship cohort, one of the things I tell our students is that if every single one of them graduates from our program and becomes the president of the Israel club on their future college campuses, I’ll consider them personal successes and will proudly brag about them to everyone I know. But at the same time, if they don’t, and instead their college experiences are devoted to pre-med majors, Greek life, or ultimate Frisbee, but when their roommate has a question about something they heard about Israel on the news or in class and they’re able to engage in a nuanced conversation about a complex topic, I’ll also consider them to be personal successes and will proudly brag about them to everyone I know. By naming both of these outcomes as legitimate and valuable, we seek to encourage each learner to set their own goals and benchmarks in their relationships with Israel. Explore narratives, gray areas, and complexities. Teens want to understand, and they’re drawn to information that’s presented in a layered way. A key component of our Fellowship is a session where an Israeli and a Palestinian sit side by side and present their respective narratives, including their understandings of history and perceptions of current events. This session, which parents are also invited to and encouraged to attend, is often challenging. Participants, and the speakers, are asked to confront their own assumptions and to accept realities that they are not necessarily comfortable with. By not whitewashing the reality of the multiple conflicts facing Israel today, we demonstrate that things aren’t black and white and that it’s ok to question and challenge the status quo. Our teens learn to connect with Israel through their own stories and the stories of others. By putting a human face to otherwise amorphous issues, we aim to build relationships that appreciate the other. Engage with tough questions. Too many individuals emerge from Jewish educational contexts with the critique that difficult issues were glossed over or whitewashed. We are vigorous in encouraging the asking of tough questions. We dedicate a session to asking the questions that challenge the status quo, and give voice to doubts, fears, and soul-searching queries that our teens are grappling with. Having given them the baseline knowledge to inform these questions, we are consistently impressed by the maturity, nuance, and sincerity that they convey. We don’t claim to have all the answers, but instead we work to explore and apply tools for finding those answers. Make sure things hit home. For us, Israel isn’t just another country, and our exploration of it isn’t an exclusively intellectual one. We’re working on developing relationships, and hope that our program is simply one step along a lifelong Jewish journey of Israel engagement. So we approach things from a place of personal connection, and encourage each participant to explore their own developing bonds with Israel. We invite local Israeli shlichim to share their stories about the army, voting, and growing up in their respective communities. At the same time, we have American staff who share their own stories of being campus activists, building their own relationships with Israel, and how it factors into their overall Jewish journeys. By personalizing the experience, we seek to spark conversations that last long beyond the parameters of the Fellowship. Israel is full of complexities and idiosyncrasies, and grappling with them is part of the territory of Jewish education, for better or for worse. For those of us who have the honor and responsibility of working with high school students, it’s critical that instead of shying away from the challenge of meaningfully encountering Israel, we capitalize on it, and partner with our learners in making this part of the Jewish journeys meaningful and profound.